These Picture Frames Stand Out On Any Wall! 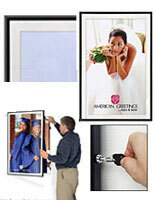 These Picture Frames Are Available From Our Huge Online Catalog At Picture-Frames-Warehouse.com! The outside dimensions of this picture frame are 24"w x 30"h and the observable area is 21.25"w x 27.25"h. The compact design permits this frame to protrude only 1.5" from the wall and also have the capability to swing open. Mounting instructions and hardware are provided. For proper operation a 1.75" area should be left on the left side. Click here to view how to mount this frame. 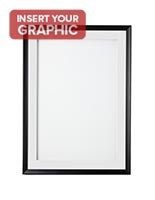 If you need to exchange your 22"w x 28"h advertising on a regular basis this is the picture frame to use. 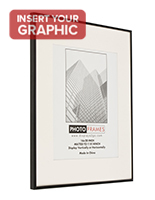 The 1/2" wide satin black aluminum framing effortlessly swings open on concealed hinges to give you entrance to your poster, print or artwork. The exchange takes less than 2 minutes because of the provided removable/reusable mounting tabs. 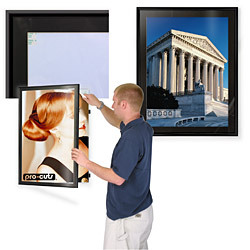 The poster or artwork is supported by a duraplast backboard and can be up to 3/16" thick. 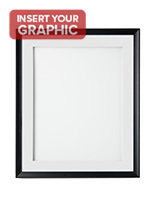 Your poster is framed in a 1" black matboard and is sheltered by a clear acrylic lens. 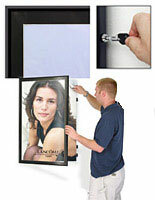 The uncomplicated yet useful gravity latch system is easy to use and stops your picture frame from swinging open.